Michelson Diagnostics has developed a novel high-resolution imaging technology, called Multi-Beam Optical Coherence Tomography (OCT), which provides a breakthrough in imaging performance. Optical Coherence Tomography (OCT) is an imaging technology based on light and optics. Similar to the way ultrasound uses sound waves; VivoSight uses eye-safe infrared laser light to obtain a 3D block of image data at a higher resolution (<10μm) compared to other modalities. 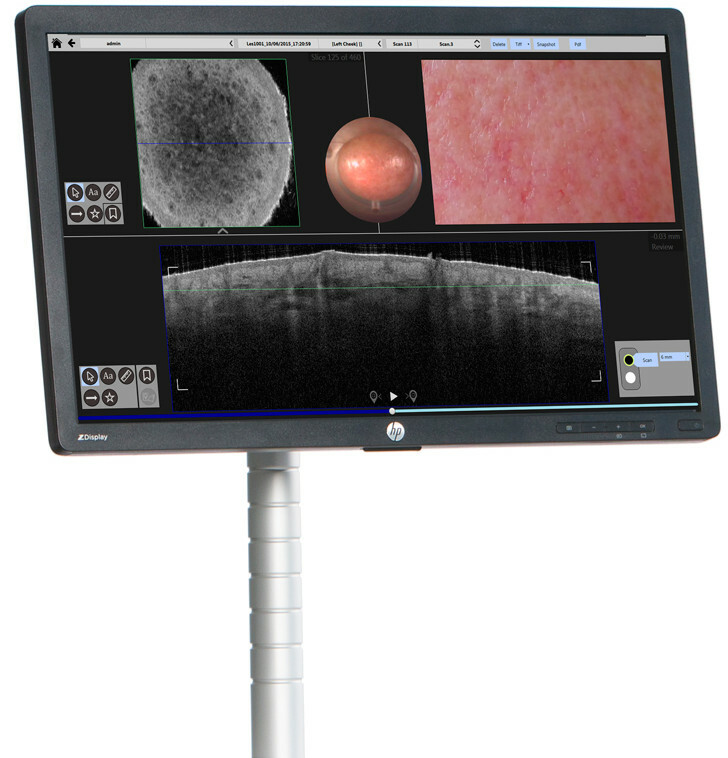 With an ultra-wide field of view of 6mmx6mm and a depth up to 2mm, the user is able not only to see deep into the dermis but also get the full picture of the sub-surface microstructure. The outstanding imaging performance is the result of the patented multi beam technology. This works by using 4 beams of light, each focusing at a different depth, giving the user not only a higher resolution but also a deeper penetration depth compared to a single beam system. 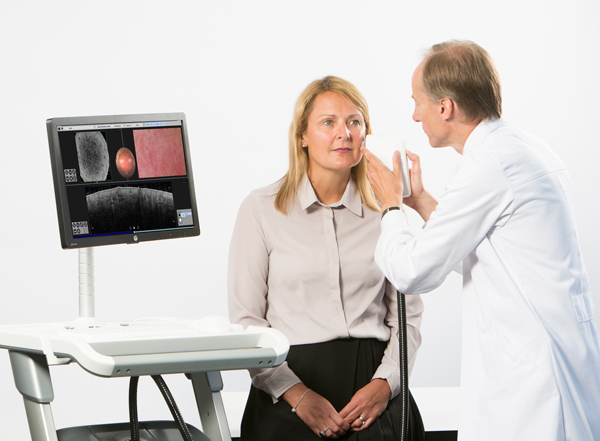 The scanning procedure is completely non-invasive and takes just a matter of seconds, giving fast results without obstructing the surface. Indicated for use in the two-dimensional, cross-sectional, real-time imaging of external tissues of the human body. This indicated use allows imaging of tissue microstructure, including skin, to aid trained and competent clinicians in their assessment of a patient’s clinical conditions. 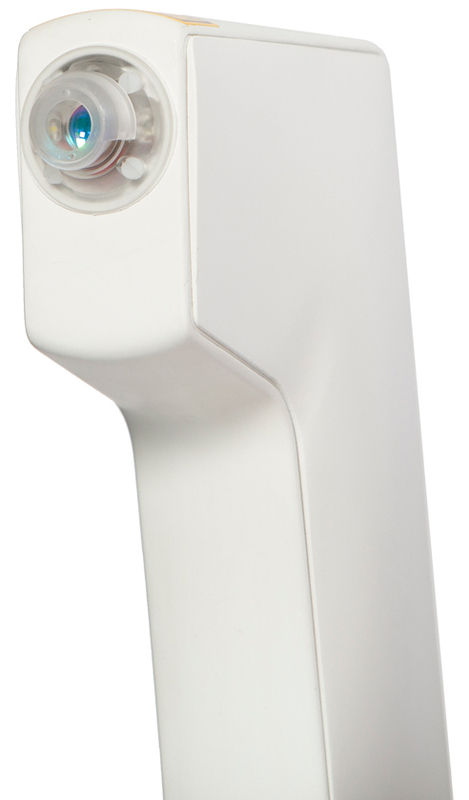 The VivoSight OCT scanner is a class-1 laser device, safe for use in an office environment without special glasses for user or the subject. The entire scanning procedure takes typically one minute or less (per examination site), and can be performed by a technician or physician assistant, so that data can be scientifically analysed at a later date, if required. 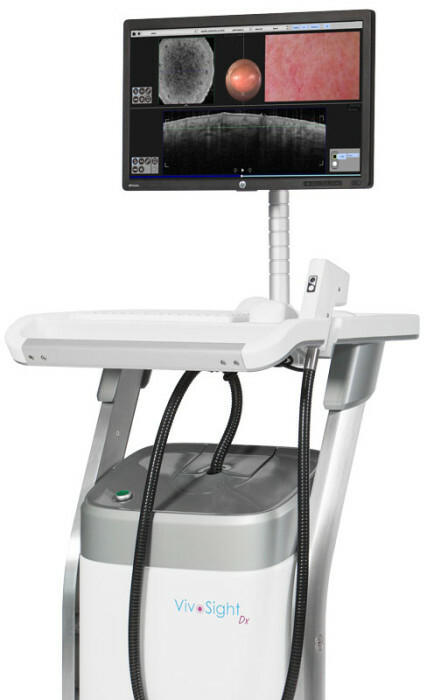 VivoSight indications for use:VivoSight is a Multi-Beam Optical Coherence Tomography (OCT) system indicated for use in the two-dimensional, cross-sectional, real-time imaging of external tissues of the human body. This indicated use allows imaging of tissue microstructure, including skin, to aid trained and competent clinicians in their assessment of a patient’s clinical conditions.